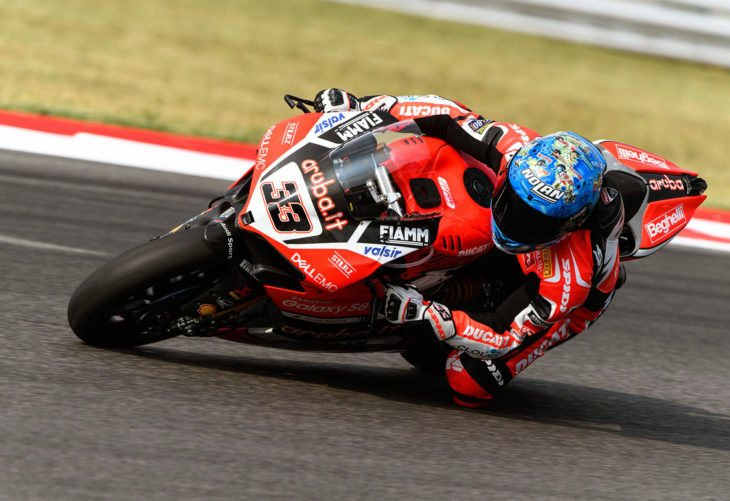 Plenty of drama at Round 7 of the WSB championship at Misano. In Race 1, Chaz Davies (Ducati) crashed on the final lap while leading championship points leader Jonathan Rea (Kawasaki). Following closely, Rea was unable to avoid running into Davies, and both riders were down. Rea remounted to finish in third place behind winning teammate Tom Sykes and second place Alex Lowes (Yamaha). In Race 2, Marco Melandri (Ducati) took his first win since 2004 with Kawasaki teammates Rea and Sykes close behind. The latest information we have on the condition of Chaz Davies indicates that he has fractured a lumbar vertebrae, has trauma to his thorax and left thumb. No indication at this point as to when Davies might be able to compete again. You will find full Race 1 results here and full Race 2 results here. For additional details and points, visit the official WSB site. Tires seem to be the story in both MotoGP and WSBK this year. Also in F1 auto racing. That was a bad crash. I’m both surprised and relieved that it wasn’t more serious. oh yeah Pirelli, you’ve ALSO gotta get your crap together in terms of tyres. 3 rear failures in 2 rounds…? what the heck…? despite the commentators not mentioning it some of us could still see that Spanish Elvis’ BMW did not DNF due to a mechanical, no HE HAD A FLAT…!!! unlike Rea and VDM, Torres was lucky enough to catch his before DISASTER struck. Pirelli Tyres you are now under my scrutiny and trust me, you don’t want that.